On February 11, 2017, the Board of Trustees promoted John Proto to Executive Director. John has been our Museum Director for the past six months and replaces Wayne Sandford who served as General Manager for the past 5+ years filling in while mentoring his replacement. Wayne was serving two roles, the second as President which he will maintain. John brings to the museum a wealth of experience and knowledge that will help the museum to continue to move forward. John has visited the museum every year from the age of 5 and became a member over 25 years ago. He’s been an active volunteer for the past 15 years. 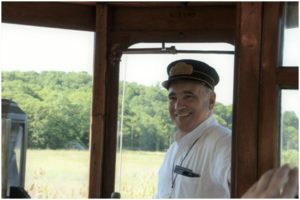 Although his volunteer role at the museum was primarily public operations, administrative and technical support, he has a passion for rail transportation as well as electrical and electro-mechanical restoration. His non-profit background extends over 20 years in the areas of budget and finance, development and fund-raising, volunteer recruitment and retention, and information technology. John’s hours are normally Mon-Fri but he is often at the museum during ‘non business hours’ especially during the operating season. John’s office is located at 14 River St.